All is not as it first appears to be as Xu Zhen converts the shop at Sadie Coles Gallery into a functional Chinese supermarket. 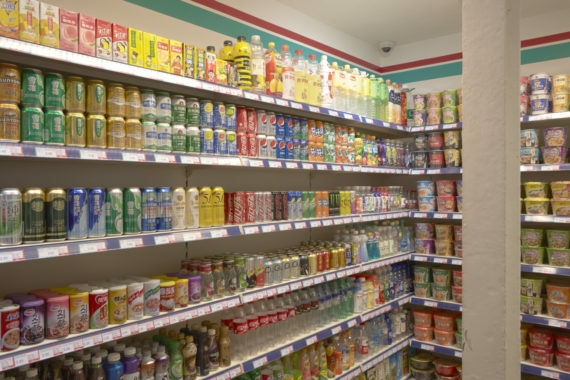 Xu Zhen has converted the shop space at Sadie Coles Gallery into a Chinese Supermarket. The space remains a functioning shop, replete with everything from Pringles crisps to women’s sanitary products, all of which are price-marked and for sale, to be paid for at the till by the door on the way out. Dwindling stock is replaced daily by the store’s single employee, or gallery assistant, such is the duality of roles and meaning here. Xu Zhen’s supermarket installation is, on the one hand, an art gallery, bearing a single work that holds up a mirror to consumerism, pop-culture, product placement, and all that they imply, while on the other the room is a shop, using those same phenomena to sell its goods. Xu’s twist is that although the shop appears to stock goods stacked neatly on shelves and priced up for sale, the products themselves are absent. The goods that stock the shelves in Xuzhen Supermarket are genuine, but every single item consists only of its packaging. What we are being sold here is a manifestation of what we all know to be the central construct of consumer capitalism; that the consumer buys into an idea, rather than a product. ‘Buy this aftershave and become instantly more attractive to women’, that sort of thing. It’s a marketing technique born out of Freudian psychoanalysis, and it plays on a raft of human insecurities to convince us that not only will a particular brand of product serve its function, but it will enrich our lives. Xuzhen Supermarket makes art buyers of us all, and we are falling over ourselves to get in on the game. Unlike Brice Marden’s terra verte paintings around the corner at Gogosian gallery, which were rumoured to have all pre-sold at over £1m apiece, Xuzhen Supermarket democratises the art market, offering us all the opportunity to own a piece of art. Visitors to the store are overcome with excitement at the thought of taking home an empty roll-on deodorant and sitting it on a shelf alongside their own domestic art collections. And who wouldn’t be seduced by the prospect of owning an original artwork, even if what they have might better be described as the by-product of an idea that conflates the roles of consumer, viewer, and collector. All of this is familiar territory for Xu Zhen who, in 2009, established a company to manufacture artworks. He named his company MadeIn, after many western people’s first and most common experience of China – that being the ubiquitous ‘Made in China’ label we see on everything from clothing to toy cars – MadeIn is self-described as a ‘contemporary art creation company, focused on the production of creativity’. The foundation of MadeIn decoupled Xu Zhen from his work, but subsequently reclaimed him as a product when it created the Xuzhen brand, of which this supermarket is one incarnation. Xu does not stop at satirising the art market – that alone would leave this all feeling a little thin – Xuzhen Supermarket is also a critique on the Westernisation of the Chinese market experience. The marketplace, a central aspect of human cultural history and social evolution, has been swept aside by the supermarket. The sights, sounds, and smells of a market have been sanitised and replaced with a global consumerist aesthetic – the fetishization of ‘new and improved’ goods, embodied by their packaging, has created a need for a constant replenishment of product. Whatever one makes of the supermarket phenomenon in the western world, its eclipsing of the traditional weekly and daily market systems can at least be said to have evolved from a gradual implementation of an idea over the last 150 years. In China, where capitalism was anathema until the 1980s, the supermarket simply appeared. Communities that were bound by the glue of their daily and weekly trips to market suddenly found themselves in artificially strip-lit warehouses that mimicked their western counterparts. Xuzhen Supermarket is a microcosm of the artworld. It demonstrates that, in the words of Marshall McLuhan, the medium is the message. It is the idea of the product and what it represents that ensures we will part with our cash in exchange for these little boxes of emptiness. These tiny voids. Metaphorically, these goods represent the silence that we insist on filling, usually with our own voices. Case in point; cigarette packaging was – across manufacturers and even individual brands – for the most part of the late twentieth century almost entirely white, save for the odd stripe or other emblem. The reason for this is that producers of this product understood that whiteness represents, along with colonial-era ideas or purity and cleanliness, a void into which meaning must flow. Lacan asserts that at the heart of selfhood is a void, which we subconsciously fill with meaning borrowed from people and places (and products) that surround us. The consumer stares into the void of packaging, and the packaging stares back. If one buys an object from Xuzhen Supermarket (other than the £100 hoodie – that’s a genuine consumer product) then one is buying into Xu Zhen’s critique of the art market. It demonstrates one’s interest in social history and consumer culture, and pins it all to a moment in time. It also stands alone as the most conspicuous of consumerist acts. One purchases an unopened, empty Pepsi can with the express intention of putting it on display in one’s home. Look at this Pepsi can, we say, but a-ha, it’s an artwork; it contains nothing, yet says everything.